It's done! This is the piece I've been working on for the last two weeks. It is a representation of the chakras, the subtle energy centers in our bodies. If you're not familiar with the chakras, this link has a really good description/explanation of them, including their color correspondences. I've been working with my energy recently, meeting weekly with a friend who's been reading my chakras. It has been quite illuminating. A couple weeks ago in meditation, I had a vision of my lower chakras -- the root chakra (red), the sacral chakra (orange), and the solar plexus chakra (yellow) -- as being a cauldron heating my energy and sending it up into my heart chakra (green). My opening heart was sending energy up into the throat chakra (turquoise/blue), the third eye chakra (indigo), and the crown chakra (purple), with energy also streaming down from my crown to my heart. The resulting stitched piece, surrounded by squares of white/ivory fabrics representing white light, is the manifestation of my vision. I had zero problems with my hands during the production of Energy Rising. I've been using this arnica oil two to three times a day when I'm stitching or otherwise using my hands intensely, and I swear it works. 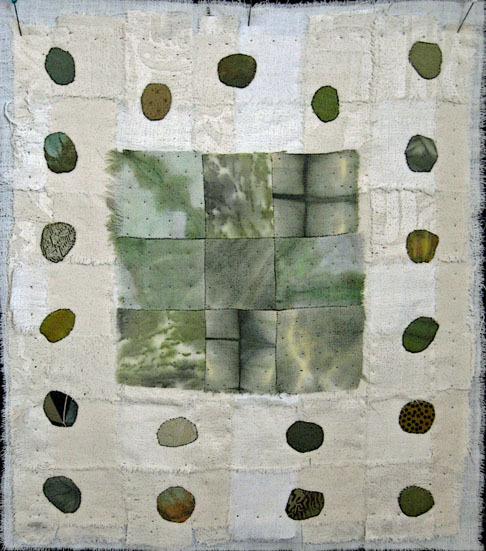 Energy Rising is composed of 115 inch-and-a-half squares of cotton fabrics (and a few pieces of silk), and measures 8 x 36 inches. So...I guess I need to begin soon on that appliqued tree I mentioned a couple weeks ago. Hope you all have a lovely summer weekend. Blessings. I spent Wednesday through last Sunday working on my latest piece, which isn't this nine patch. I won't show the new piece until it's finished. It's long and narrow, that much I'll say, also that it has personal significance for me at this time. What I accomplished last week was to assemble the 115 inch-and-a-half squares together, add batting (a thin piece of fabric) and backing, and quilt it. I've just begun the embellishment, most of which will be embroidery. The next few days are completely clear for me so I hope to make a lot of headway...or possibly even finish. I'll also say that this piece, which came to me last Monday evening, will be the first piece of art in my life that went from inspiration to fruition in such a brief period of time. I've been known to fiddle-fart around to the point where I completely talk myself out of even bothering to begin many projects in my life. So this new thrust of "idea to manifestation" is new for me. I attribute this change to numerous threads in my life right now ~ the idea of impermanence, that everything changes all the time and that we only have now, really; the opening of my heart and my creative channels with the healing work I'm doing; love of the raw materials and the sheer joy of working with them; and likely more I can't think of at the moment. 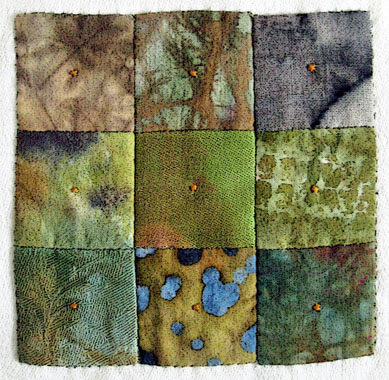 The small piece above was a test piece I did prior to completing Gravity's Rainbow, on which I experimented with construction methods as well as that cool embroidered dot (thanks Jude) in the center of each square. Lots of good things happening here. I hope there are in your life as well. 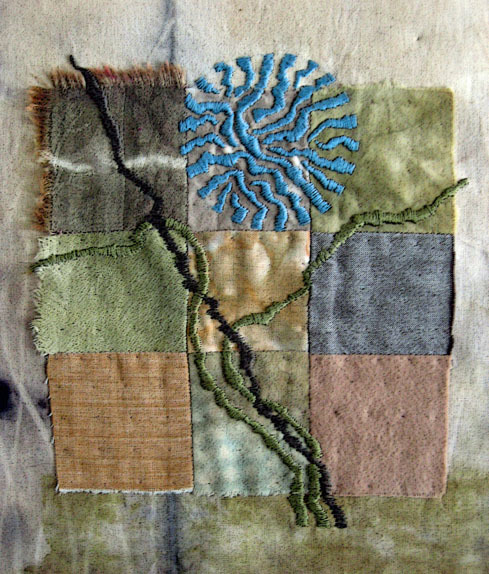 This is a stitched piece I've been working on. I actually started it before Gravity's Rainbow. This one will be called Tree of Life, and my next step will be to fashion something tree-like in the center. Originally I thought I might embroider the tree, especially after seeing the awesome embroidery Jude has been doing lately. Towards that end I spent most of last weekend trying out my embroidery chops -- satin stitch specifically -- on a nine-patch sampler I made for that purpose. Jude uses a stitch she calls Stacked Running Stitch, and I did try some of that in the piece below. Satin stitch works better for me, though. Although it does use more thread, satin stitch goes much more quickly, and you don't have to keep moving your stitching hand back and forth between the front and the back of the fabric. Anything to do less unnecessary hand movement in my book. Instead of embroidery, I decided to applique a tree. But alas, this project will have to wait because I had an inspiration for another piece on Monday night that I am hot to get moving on. The last photo is of my favorite piece of my own art, from the 1970s. 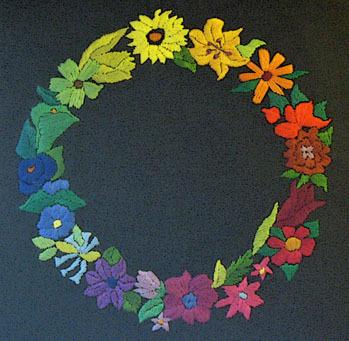 A framed color wheel of satin stitch flowers, inspired by my 7th Grade art teacher who taught us about color wheels. Hint: the new handstitched piece is another rainbow of sorts.